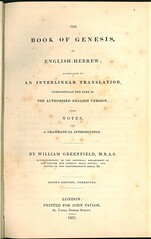 For sample verses from the translation by William Greenfield, click here. 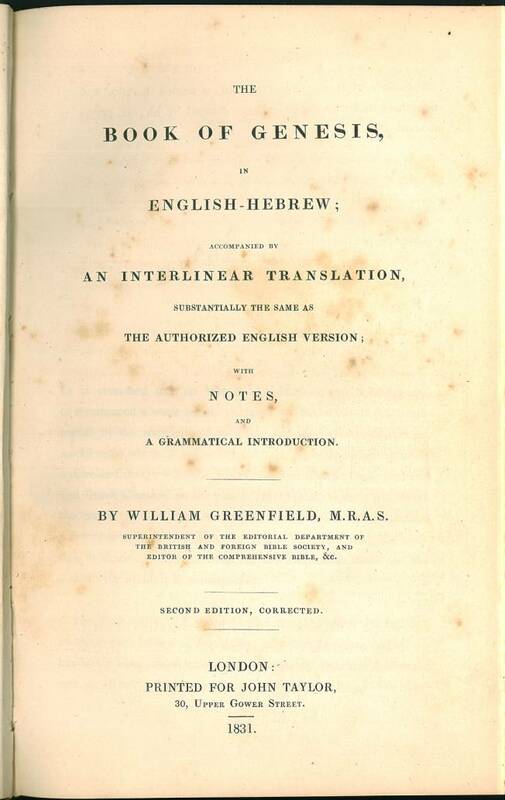 Title: The Book of Genesis, in English-Hebrew; accompanied by an Interlinear Translation, substantially the same as the Authorized English Version; with Notes, and a grammatical introduction. By William Greenfield, M.R.A.S. … Second Edition, Corrected. London: Printed for John Taylor, 30, Upper Grove Street. 1831. Facsimile: A pdf facsimile of the 1828 edition is available at books.google.com. Comments: This is the second edition. The first edition was published in 1828. Other editions were published in 1836, 1843, and 1848.